Sentient Developments: Philanthrocapitalism or philanthrobabble? If you want to turn a rock over on philanthropy I think you'd uncover more snakes if you look at government assistance. US foreign aid is largely a way for them to subsidize their agribusiness sector but dumping excess production on the first world often with devastating effects. Its interesting that the principal lobbying for increasing American aid to africa comes from agribusiness, GM food producers, packaging and shipping companies who all coordinate and pool their lobbying efforts. I don't know the ins and outs of the Gates Foundation but what little I do know sounds much more encouraging. And I'm not much of a fan of Gates in general. "Corporate charity" could very well do more good than government charity, and is obviously better than no charity at all. 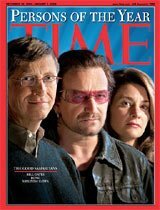 Gates can't be thinking about creating a new $100M market by curing malaria, because people who are suffering from malaria aren't going to turn around the next day and buy a computer. It could take over a decade (sans nanotech) for purchases like that to be feasible on a mass scale, $100 laptop notwithstanding. I think you have some errors in the numbers of your article. Malaria costs $12B per year in GDP for Africa. Curing Malaria back in the 60's would have provided large boosts for years. The cumulative effect would depend on the annual gains to be effectively invested.